A long term client of mine, Ian Cummins, was in town this week. He’d been on a bit of a world tour, flitting between the UK, Ireland and the US, inspired by his need to attend a family wedding in Ireland. In the course of his trip he’s been to the UK, Ireland, over to America, and now back to the UK. Knowing he’d be around at some point I extended an open invitation to meet up if he had a free day. Over this past weekend I had a message from him that he was gonna be in London for Monday, and if I was around we could finally meet. Annoyingly I was still on a placement at a trendy advertising agency on Tottenham Court Road, so I wasn’t free that day, but I suggested we could do lunch if he could be around at 1pm. I suggested we meet outside the Dominion Tottenham Court Road, which is a good meeting point in the area. I have often noticed slightly vacant looking tourists standing around outside there, so have assumed they were also waiting for meeting colleagues to arrive! I broke for lunch as planned at 1pm and headed down to meet him and to be as conspicuous as I could be I wore my Ten Coat, hoping he’d spot it. As I walked down the road I spied a familiar face, a good hundred yards or so from where we were supposed to meet. “Ian?”, I said. “Yes?” That was lucky – we’d have been standing around wait for each other for ages! 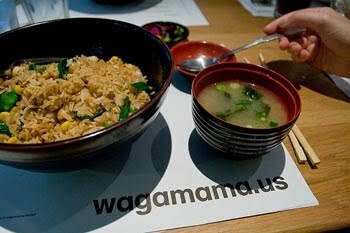 We went to Wagamama, on of my favourite restaurants in the area. Unusually there was no queue and we got seated straight away. We had a lot to talk about and catch up on, but one thing that did come out of our conversation was regarding the original Six Frock Coat. My friends who own one of the screen used coats are proud that their coat also has a number of the original silhouette cats inside it. 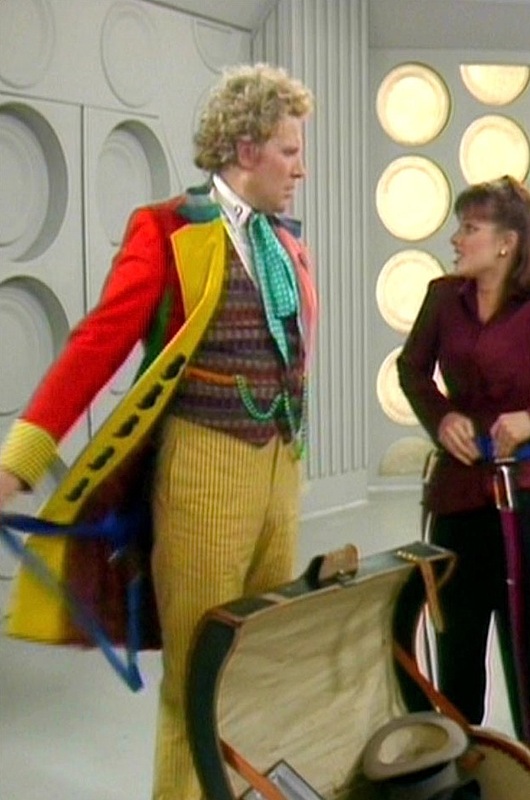 Basically, Colin Baker is a big cat lover, and it was his input to the costume that it included a broach of a cat on the pink lapel. He also had small black felt cat shapes sewn into the inside of the yellow lapel, one for each adventure (see right). They were sort of like the air kills marked on RAF fighter planes in World War Two! 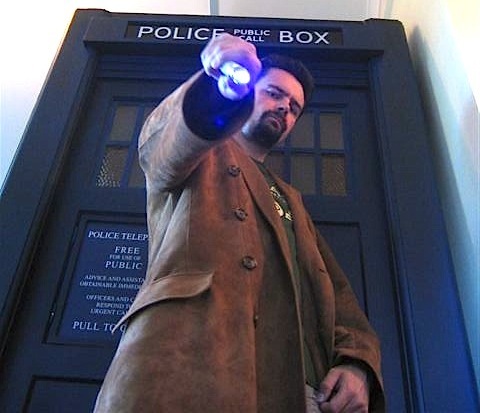 After a while Colin tired of the idea, and they were all removed for his later season, so none of the screen used coats retained them at the end of filming. Luckily Colin had kept some and these were acquired are returned to their place inside the coat, though not a complete set. As it happened, Colin Baker went the Australia a few years back, and had auctioned one of these felt cats for charity. Ian was the lucky buyer. When he saw the coat on classicdoctorwhoprops.com, he realized the place for it was back on the coat, along with the rest of the litter! He contacted them, and within a few weeks it was back where it belonged (see left). The next day I wasn’t working, so I suggested we could meet up and I could give Ian a bit of a tour of London to see some Doctor Who sights. We met up for his tour at the Police Post in Piccadilly Circus (see right). Ian had done Trafalgar Square and Westminster the previous day, so we started by taking a little detour through Soho to see the fabric shop I had sourced a number of fabrics for his Frock Coat. He was amused to see the bolt of material still on display, as well as part of the distinctive lining I created. We then took a walk down towards The Cinema Store on St Martins Lane, before heading down to The Strand and the Stamps Centre, which has a substantial trade in Doctor Who merchandise. On our way we took in John Adam Street, a house on which had been used as Number Ten Downing Street in Aliens Of London and World War Three back in 2005 (see left). It was heavily dressed, but Ian clocked it straight away. We then jumped on a tube from Embankment to Tower Hill so we could visit Butler’s Wharf on Shad Thames (see right). Any excuse to walk down this iconic street, and I’m there! It’s such an inspirational location, and the bridges spanning the street are so dramatic to look at, it give an enormous depth. Following the riverside walk heading up-river towards The Globe Theatre, we passed Southwark Cathedral, where the closing scenes of The Lazarus Experiment were set (burt not shot); and took in Clink Wharf where part of The Talons Of Weing Chiang had been filmed. Crossing the Millennium Bridge from outside the Tate Modern art gallery, we took a look at where the St Peter’s Steps once were, site of the Cyberman march from The Invasion. A sudden deluge of rain meant we had to pause for a few minutes under the bridge until it cleared, before continuing past St Paul’s Cathedral and on to see the other remaining Police Post in St Martin Le Grande (see right). It’s a bit out of the way, and sometimes hard to find amongst the back street of the City, but it is in better nick that the Piccadilly Circus one, so worth a look. 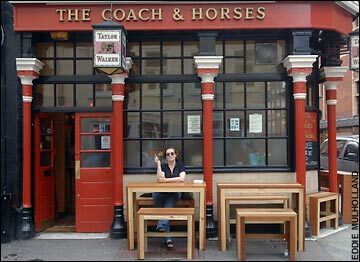 We we only doing a short tour, so we then returned to Soho to catch some lunch, a drink and a long chat in The Coach And Horses (see left), a pub that Tom Baker used to drink in. It was a pleasant afternoon, punctuated by an unusual number of vagrants who kept coming in and hassling the drinkers. The staff seemed to be seasoned in expelling them, so we weren’t bothered too much. After a good old chat it was time for me to head off home and say goodbye to Ian. It was real great to meet up with him and put an accent to an email.